Dres Renegade is a rare Intelligence creature card. It is part of the Core Set. In addition to the card's availability in the Core Set, two copies are included in the Dunmer Avengers deck, and one copy in the Tribunal Glory theme deck. When Dres Renegade is summoned, all friendly creatures get unshackled, and in the case of ongoing shackles (i.e. Arrest) they will not become reshackled. 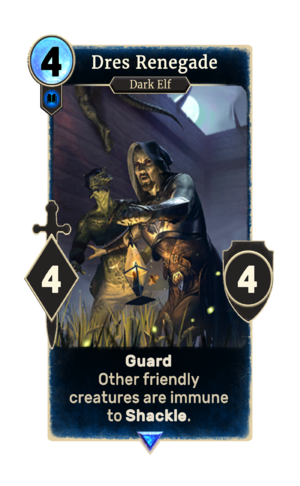 The card is named for House Dres, one of the Great Houses of Morrowind. This page was last modified on 14 February 2019, at 01:03.